In order we avoid any misunderstandings we would prefer written instructions for your deliveries. The information we require would be as follows. iii)	any appointment or specific delivery times, customer mobile ? iv)	the service level required , ie Next day 24 hrs or 2 / 3 day service. If any restrictions apply particularly with a private house deliveries and who might receive the delivery. The normal delivery vehicle is usually a 30ft long rigid. ( a similar size to the council waste refuse vehicle ) . If a small vehicle is required owing to the delivery point restricted access , we would ask for this prior information. Any refused or returned deliveries would incur a further charge as a result of the lack of this information. 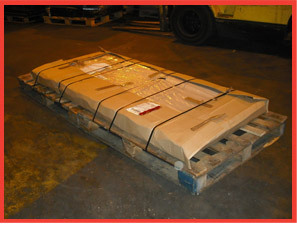 For ease of movement and mechanical handling we request that goods are placed and secured to a suitable wooden pallet. Goods secured to a pallet rarely suffer damage or loss. We advocate the use of bubble wrap, cling film, cardboard packing, plastic or steel banding securing the goods to the pallet. Additional packing with these products usually assist the securing to the pallet and reduces the risk of damage and loss. Why throw your empty cardboard boxes and received packaging materials into the waste? . Why not make use of your boxes and bubble wrap in additional packaging and wrapping to your goods being sent out. Please remember to place a CLEAR ADDRESS label onto your finished banded and wrapped pallet. We will also attach a BAR CODED label once we have received your pallet through our depot. Pallet sizes & Over sized goods. 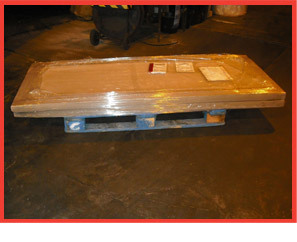 We do not accept any responsibility for loose items placed on the top of a wrapped pallet. We do not accept any accept claims for damages for goods that overhang the edge of the pallet. Please may we ask you to note some suggestions for items that exceed the footprint of a wood pallet, 1200 by 1200 ( 4ft by 4ft). If you have oversized or odd shaped goods then we would point out the problems associated with your goods overhanging the pallet. Overhanging goods can suffer damage very easily. Avoid this by making a larger base to secure your good onto. A bespoke pallet perhaps but more readily available, why not use two pallets together and form a larger base.? For example a normal size door or a number of items of this size, being almost 7ft tall would be place on a base of two pallets. Wrapped in cardboard and bubble wrap for protection. Similarly when banded to the base pallets, one large base lift is created. Also, the edge of the doors would remain with the boarder of the base pallets. Thus you will eliminate any overhanging goods and the possibility of impact damage. We try to ensure that your goods are delivered in good order. Help us to achieve this by correct use of packaging materials and satisfactory securing to the pallet. Your goods require a serviceable and suitable pallet if we are to deliver your goods to your end user….. Please ask for details and advise if in doubt as we will offer our experience of packing and securing for transit. If at any time you feel that you have a claim pending for loss or damaged goods please would you refer to the current Road Haulage Association Carriers Conditions of Carriage, in particular the sections covering claused delivery notes and the relevant time limits for the presentation of a claim. If you are mindful that a “ claim” for loss or damage is apparent, You must put your claim in writing to our office with 7 days of the delivery. Upon a legitimate claim being received and accepted, our insurers will apply the terms (currently RHA 2009 Conditions of Carriage), to the letter, to investigate your claim.